I know that Heki is not a favorite right now but he sure seems like it. And, I know that I’m not alone when I say that the suspense increased with every following page. Yeah, Heki is holding his own. Even Kitari, who looks down on him is impressed. 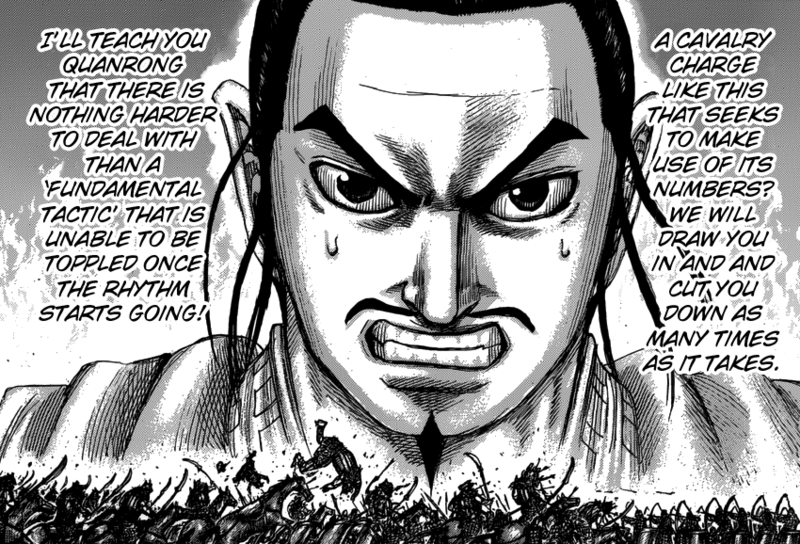 Heki bro sticks with the fundamentals of war. Not only does he put a dent on the opposition, he also demonstrates Qin's prowess (and I luv it!). Just hope his pride doesn’t get the best of him. The last thing they need is another screw up and all because his head got too big. Oh, and Yo Tan Wa is feeling nostalgic. I've never seen this side of her before. There are a few things I'd like to address that I believe are important. I can think of two good reasons why Yo Tan Wa can’t afford to lose this fight. If she’s defeated it will affect the morale of the other armies and alter their performance. Also, we can’t overlook that a personal vendetta against Qin’s mountain King may actually exist. After all, she is responsible for Ri Boku’s humiliating defeat at the Battle of Sai. I believe that Shun Sui Ju won’t settle for anything less than a vicious payback. And going by his plan of execution, from what we’ve seen so far, it looks like he seeks to completely annihilate them. Secondly, if she’s gone then everything she and Sei worked for could disappear. The alliance between these two culturally different people will go back to the way it was after the betrayal, a deception that still emanates among the elders of her tribe. And all she worked for including her goals will vanish. So you see, there’s a lot at stake for both cultures. She needs to win this. Any thoughts about old man Enpo? Do you think his people are vital? If so, how will they help reverse the tide?